The glorious land of Indus has witnessed many historical events and Great personalities. Faqeer Sayed Anwar Ali Shah Was one of the Great Sufi poet and saint of the sindh,who guided the people by his poetry and taught the secrets about the relationship between the people and the God. Sayed Anwar Ali Shah was born in the home of the Makhdoom Sayed Khuda Bux Shah in 1906 at village Jahanpur Sharief witch is situated on the right side of Qazi Canal. It is about 16km away from Ghotki city, sindh ( Pakistan). He belongs to sayed family, his relation with 10th Imam Ali Naqi.A.S.In the early age. He was sent for early education at muhmmadpur and ubauro (Tehseel of Ghotki) but he did not shown interest in education and returned home where he completed Quran in seven years old, by hearts.His forefathers came from Arabs. 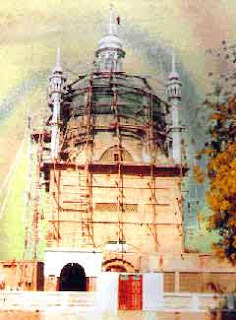 They had migrated to Utch sharief ( Punjab) and shifted JahanpurSharief (Sindh) later.In the age of 30 years, he took Baeet from Hazrat Sayed Sahib Dino shah (Wasti Iniyat Shah) who was mureed of imamul Arfeen Hazrat Bahoo Sultan. He established Khangah (Maikhana) at village Jahanpur Sharief where he teaches the people about the secrets of life and relationship of God. He wrote the book on poetry contened Sindhi, Siraki, Urdu, Hindi and Parsian languages. He played significant role in the spread of Islam by his acts.His life was the symbol of (P.B.U.H). His poetry based on Hub-e-rasool and oneness of God. His poetry book “Anwar shah Jo Risalo” was recently published under the guidance of Faqeer Sayed Sakhawat Ali Shah the 2nd sujjadah nasheen of dargah alia Jahanpur sharief. He frequently visited Dargah Shah Abdul Latif Bhitai.The famous Sufi poets of Sindh.Ghamdil Faqeer, Mohammad Faqeer Khatyan, Budhal Faqeer remained close associated with him. Urs Mubarak: His annual Urs is celebrated at Jahanpur Sharief on every year.Thousand of people come to pay tribute to him from month of Muhram ul Haram 21, 22, 23 of different part of the country.